So, today I'll show you some fun we had over the Easter weekend. My lil' sister from Asuncion came up for the holidays and had the wonderful idea that we should make some cake pop-eggs! Here my niece is crumbling up the chocolate cake for the raspberry/chocolate eggs. Here my other niece (I do have wonderful nieces, by the way) and my beloved redheaded daughter are crumbling up the sponge cake for the tiramisu cake pop-eggs. I know I look absolutely beautiful in this shot, so please don't give me any compliments! We're making little Easter baskets as well. We had a great time, and I would like to thank my sis and my nieces for the wonderful morning. 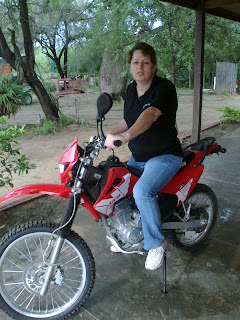 We were very happy, but we wanted to buy a motorcycle that Amy could use, as she has her driver's licence since January. So we brought that moto to the shop and brought this beauty home last week. The Kenton was a 250 cc. and too big to drive (motor-wise) for Amy, and this one is a 125 cc. She loves it! She was so happy, that she went and made pretzels! No, actually she did that because I was too lazy to, and she, no, we all love eating them. I have tons of work in my sewing room, so I'll end now. Hope you had a blessed Easter with friends and family that loves you as much as mine do! P.S. I bought myself an iPad a few weeks ago ( :) Anyone have suggestions or advice how to post a blogpost on it? I'm only finding paid apps for it. Posted by the Chacogirl at 4:45 p.m.